Run it in Custom HTML Prompt windows. 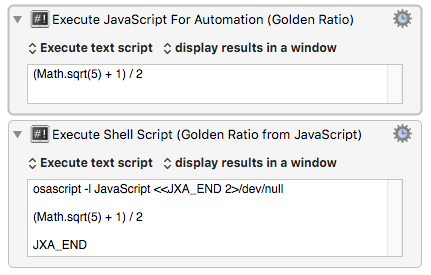 The JXA script may be accessed as text in the Action, or from a file. 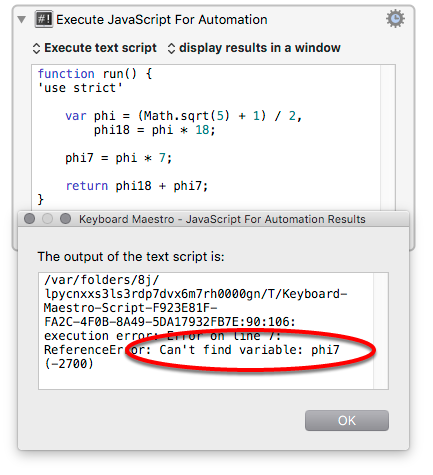 You can access Keyboard Maestro variables (7.1+) from JXA scripts using the Keyboard Maestro Engine application. 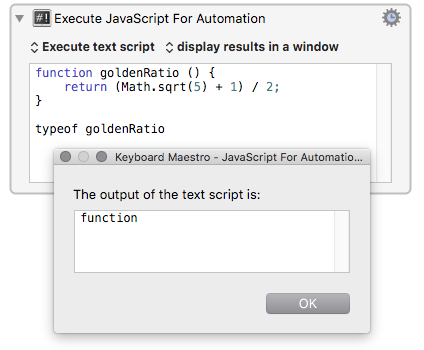 var scriptResults = "Text Determined by the script"
JXA can get a list of all variables as described on the forum and those methods also provide more convoluted ways to access variables for versions prior to 7.1.
with additional access to a lot of low-level Apple system functions through the Objective-C object. the result will be a listing of all the pre-defined names in JXA's osascript environment. The simplest scripts evaluate an expression and return its value. If the result of an evaluation is not a string (or something simple like a number, that can automatically be converted to a string), the action may puzzle you by appearing to produce no result. 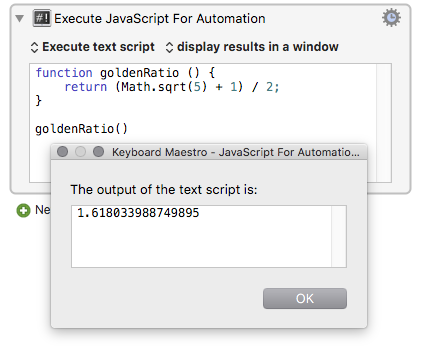 It's a good idea to test your action code first in (El Capitan or Yosemite) Script Editor, which shows all results, whatever their type, including error messages. 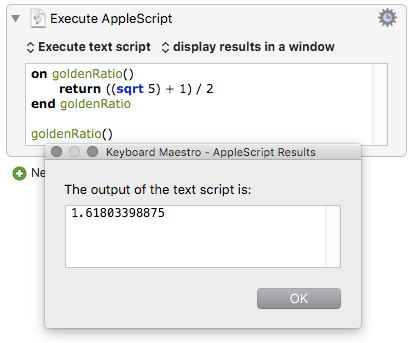 The dot corresponds to Applescript's of, reversing the sequence of object name and property name. count of documents of application "TextEdit"
In both languages, we can call/run/apply a handler/function (that is, get an evaluation of it), by adding a pair of parentheses to its name. (If the function has an input argument, the argument goes between the parentheses). 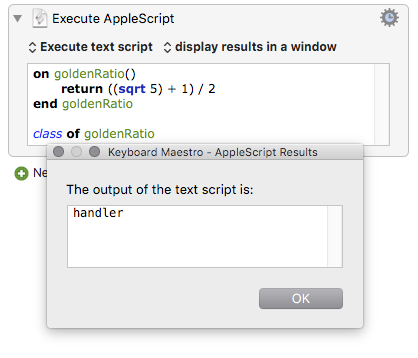 In AppleScript, the word return in the handler is optional – if you omit it, the value of the last expression to be evaluated inside the handler will still be returned. If you are building a well-proportioned temple or table, you will probably want to multiply the Golden Ratio by something else, so a named computation with a variable 'parameter' or 'argument' might make sense. Both languages allow us to include explanatory comments. AS prefixes comments with two dashes, JS with two forward slashes. In addition to reusable names for particular computations and their arguments, we can also give names to the results of computations. Once a result is stored in a named variable, we can reuse it without having to recalculate it. 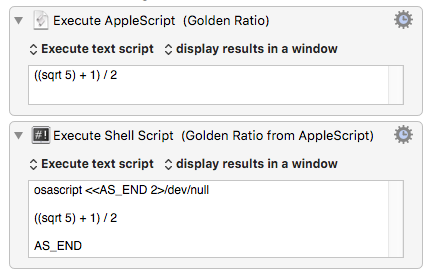 In osascript (AppleScript or JXA), run is a special name. A handler or function with that name is called automatically – you don't have to append parentheses to call it, like we did with the goldenRatio computation. In fact, when we don't assign any names to computations (don't create any AS handlers or JS functions), osascript automatically wraps our our script in a computation which it names run, and immediately calls it. -- "Sun -> Mon -> Tue"